Dozens of people gathered in front of the Kern County Superior Court building for the 6th Annual Crime Victims’ Rights March on April 10. They held posters of people they have lost and shared their grief with others who have been through the same. The event held by the Kern County District Attorney’s Office began at 4 p.m. at the Liberty Bell. The public had a chance to meet others as well as stop by the many information tables and displays to learn about community resources and support. 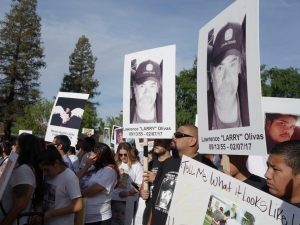 Before the march began, several speakers including Bakersfield Mayor Karen Goh and a survivor of Las Vegas Shooting recognized those who have died from violent crime and their families. They also shared messages for those who feel that justice has not been served after losing their loved ones. District Attorney Lisa Green addressed the crowd and pointed out that their bad experiences with the criminal justice system are unfortunate but somehow expected. “Sadly, the criminal justice system does not always provide the answers you seek. However, we are a nation of laws, and sometimes the law cannot be reconciled with your expectations of justice,” Green said. Some of the people in attendance disagreed with her statement. Danielle Case, who advocates for harsher penalties for drunk drivers, said that the sentences they serve are not proportionate to the severity of the crime. Dianna Davis, who also attended the event, shared that sentiment. “Take pedophiles, for example, they should be locked up for life,” she said. Other speakers included families that have been victims of crime. Carl Harris talked about the death of his youngest son, Cody, who was 20 years old when he was shot and killed while at the park in 2013. His father said that time has helped him heal, but he will never understand why crime happens. “How can someone walk up and take the life of somebody they don’t know? How do we stop this senseless violence? By all of us working together, we will find a solution,” Harris concluded. Laura Maldonado also took the stage to share her family’s story. Her family has had to deal with two deaths in recent years. Her 15-year-old grandson, Cipriano III, died in a stabbing in 2012. Then, in 2016, her 35-year-old son, Cipriano, was killed in a shooting. The Maldonado family finds comfort being around people who know how they feel, so they attend the march every year. “It’s great because it gets the families out to express their feelings and know that they are not alone. We’re showing our support and showing that they’re not forgotten,” Maldonado said. After honoring victims by sharing their story, the march began. 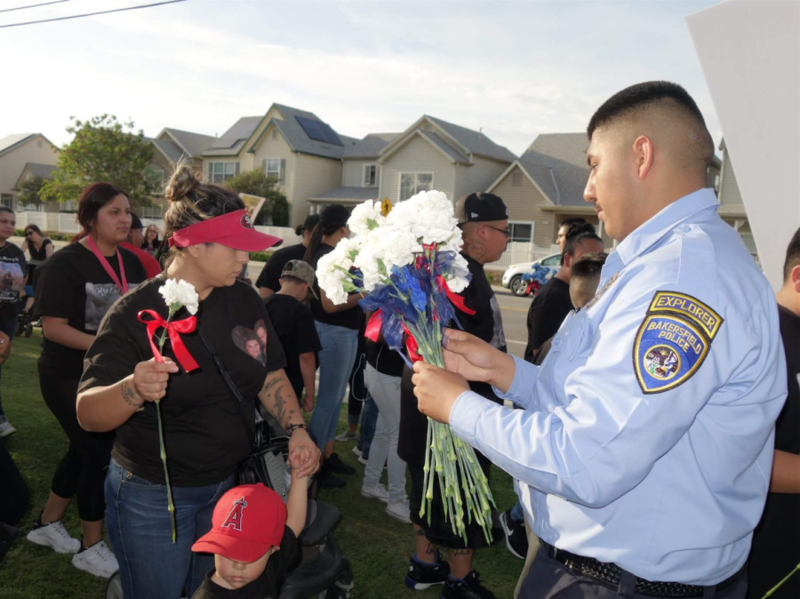 As they walked, some police officers shook people’s hands and gave them flowers. The group made its way down Truxtun Avenue, 21st street, and stopped at Mill Creek Park. There, marchers held a candlelight vigil in recognition of those who have passed away. The District Attorney’s Office holds the event as part of National Crime Victims’ Rights Week, which was from April 8 to 14. “We hope that events like these can help ease the burden for families,” Green said.